A lot of web hosts have Let’s Encrypt built into the CPanel. Not mine. I was kinda annoyed. I tweeted at them to ask if they’d support it. They wouldn’t. So I decided I would make it work myself. To do this is pertty simple. I’m just going to start by copying and pasting text from a previous article. 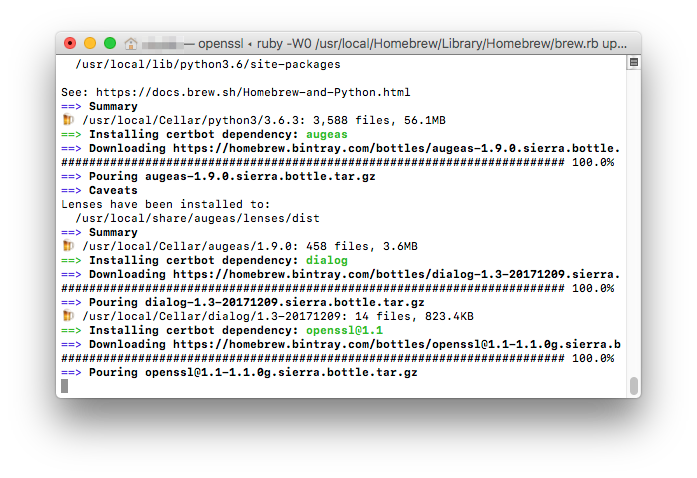 Open up your Terminal.app (Go to the Go menu, choose Utilities, double-click on Terminal). This isn’t even a step, you should know this. At this point, you will be prompted to press RETURN to continue. Press the return key. It will then start downloading and installing Homebrew. 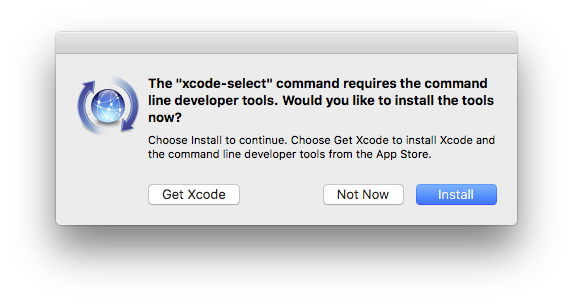 Turns out you need XCode Select installed, too. So I ran this code. That popped up a dialogue box, I said Install. 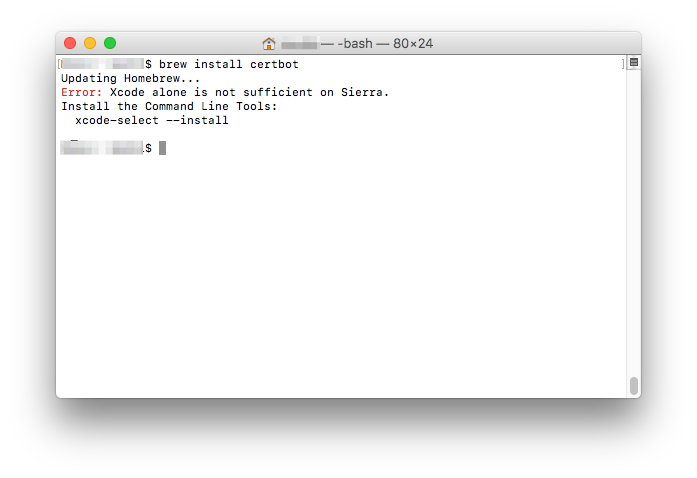 This install took a few minutes, and then once it was done, I was ready to install certbot. The program will ask you a few questions, if you’re okay with your IP being logged. Then it will, for each included domain, ask you to set up a TXT record. Go to your CPanel, yourdomain.com/cpanel is usually the address. Click on the DNS Zone Editor. Click the down arrow beside “Add Record” and choose to add a TXT record. In the name field put what it told you in Terminal, aka _acme-challenge.yourdomain.com and under Record paste in the gibberish string that certbot told you. Back to Terminal, press enter to proceed. Repeat these steps for all domains. Wait for it to validate your domains. Using the cp command you can copy the two files over to your desktop. Go back to your front page of CPanel and look for SSL/TSL, and click on that link. Your list of certificates at the top will update and beside the new one, click on Install. 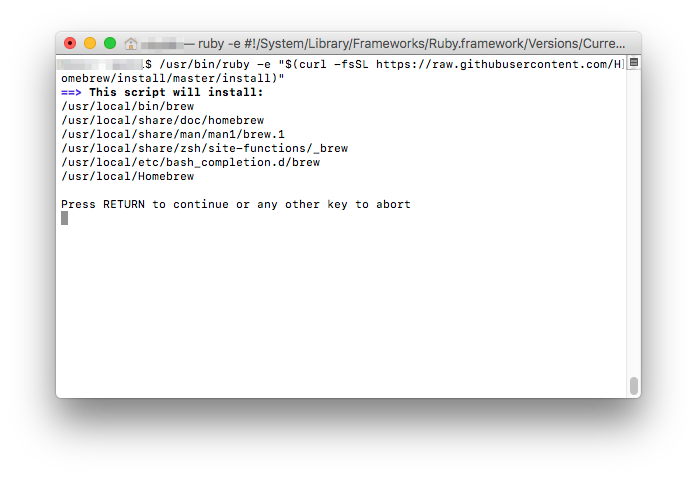 Open the privkey.pem file in a text editor, like BBEdit, and copy it’s contents. Paste that into the key area and save. In July, I will be presenting at MacAdmins at PSU. My talk will be called “OMG! APPLE IS GUTTING SERVER.APP!!! !” I will be using my blog to document all the processes taken to get all the data. The goal of this is to find easy ways to move away from Server.app while utilizing the existing Apple hardware in your server closet and macOS. Sure you can move to a new system, but you might not have the money or time. You can find the slide deck here. So before I start, I should say that this is fully documented in Apple’s macOS Server Service Migration documentation, which is almost perfect. I’m only making two small changes. First step is to test the server. After booting this VM, I set my DNS to the testserver. It loaded no problem. Here’s the first change, and important one… LAUNCH XCODE and agree to the terms and conditions, otherwise it won’t work. Apple says to grab at least one signature. I did it, I don’t know if that was necessary. make test … this seemed to go on FOREVER, so control-c‘ed out of there. I don’t know if I was supposed to. Here’s the next place I disagree with Apple, they say, “Set file ownership to root:wheel.” However, they use chmod, and it’s chown. Wow. Apple has made this super easy. Hooray for Apple. All your existing settings will be there already. Really. It just works. At that point I duplicated /etc/apache2/httpd.conf, renamed the duplicate httpd.backup and now I have a backup in case I screw anything else up. Since I was using Munkireport as my test, I needed to edit httpd.conf to point to /Library/WebServer/Documents/public. This makes the assumption that you already have an SSL certificate. Much of this is universal, but it’s told from the point of view of using a free cert you got from Let’s Encrypt. My starting point was this document. I don’t know if this set actually matters, but I did it. You need to edit the Virtual Host file /etc/apache2/extra/httpd-vhosts.conf and paste into the end of chunk of text. Go up to the link and grab the text. At this point we diverge from the above link, I had tested and it didn’t work. I started with a simple MunkiReport instance running in Server.app. I figured this would be using enough resources to move. I also got a certificate with Let’s Encrypt and had all traffic going through SSL. While the blog post is specifically for servers running 10.12, my steps were the same in 10.13. 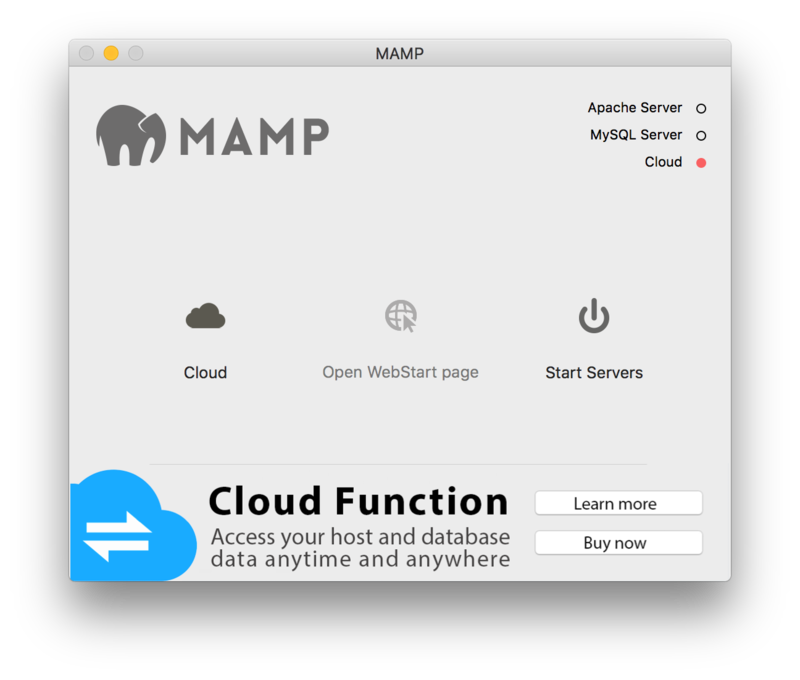 Let’s start by downloading MAMP. Run the installer you had downloaded. Click start Servers, and check that yourdomain:8888 is working. 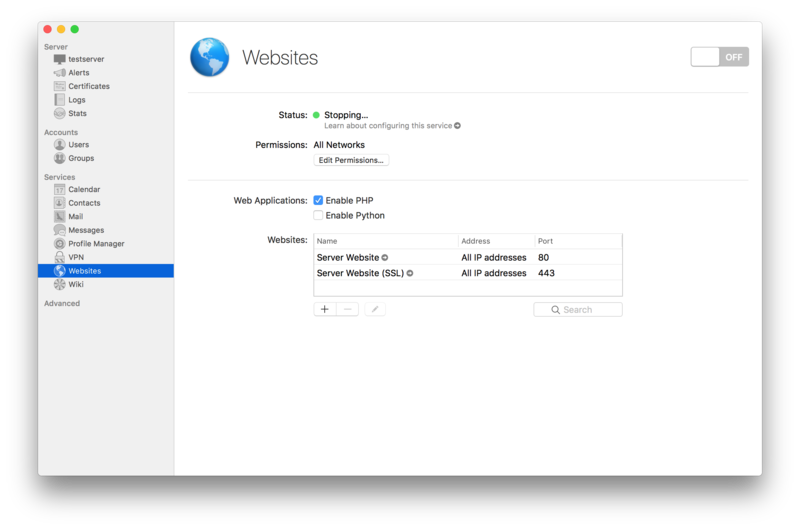 Go to Preferences and click on Web-Server. Set the location to be the old root folder. Stop/Start the server and test. Go to Preferences and click on Ports. Click that “Set Web & MySQL ports to 80 & 3306 button. Stop/Start the server and check to make sure it’s working on port 80. Your web server is up and running. Mostly. Next we need to get SSL setup. 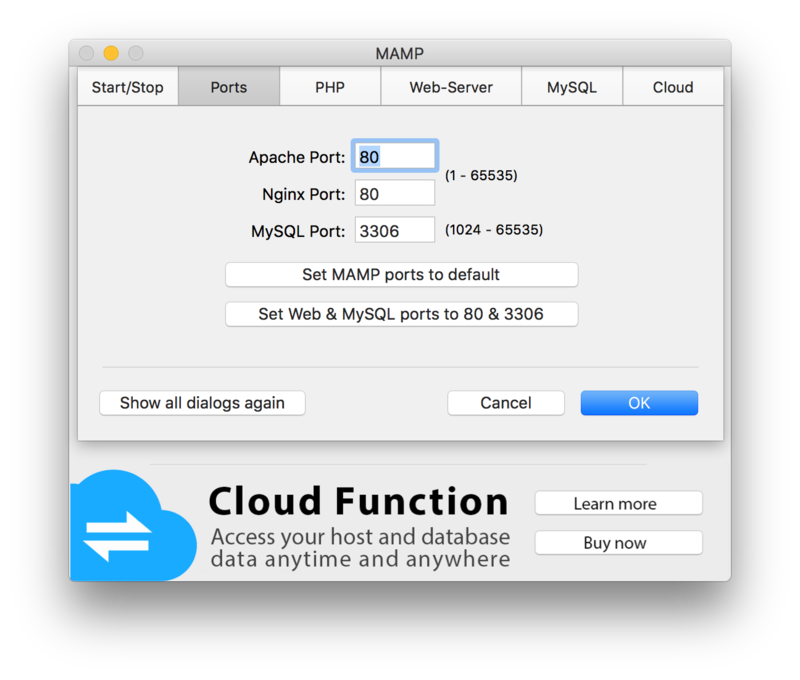 MAMP Pro has an easy GUI to do this, but that costs money and this is easy enough for our needs. I used this this gist to help me through this process. We already know that MAMP is working on port 80, so you can ignore the first bits of that file. Duplicate your /Applications/MAMP/conf/ folder, rename the copy something like conf.backup. Open /Applications/MAMP/conf/apache/httpd.conf in BBEdit or your favourite text editor and uncomment by removing the #, Include /Applications/MAMP/conf/apache/extra/httpd-ssl.conf. Edit /Applications/MAMP/conf/apache/extra/httpd-ssl.conf and search for General setup for the virtual host. From there, you’ll want to enter the path to the web files. In the same file, you’ll see information about server.crt and server.key. Rename the server part to match the names of the files in step two. I’m new to APIs. Have quite a bit of FileMaker experience. I’ve decided to see if I can build a system to track parent-teacher contact. This is a system that once existed for the school in an ASP system that I mocked up and outsourced. It was replaced with Edsby, an LMS system that wasn’t truly designed for this purpose. We were smashing a square peg into a round hole. My proof of concept for this system involves seeing if I can build something that does three things I’ve never done in FileMaker before. The first step was surprisingly easy. Thanks to a blog post that had the entire process outlined on a simple PDF. Thoroughly detailed post from William Porter of Rucksack Texnology. Step two is actually step three, but ending the blog post with “I haven’t done this yet” would not be very exciting. For step three, I got off to a bad start. I did some research and didn’t realize that JSON support was added to FileMaker 16 and was looking at a third-party plug in. That plug in was super-confusing, so I stepped back. At that point I decided to upgrade from FileMaker 15 to 16, as I knew I needed that for the OAuth login. Now that I had FileMaker 16, I decided to rewatch a Lynda.com video that I had watched months ago, and see if there was anything I missed there. There was, there was a whole section dedicated to JSON. Ready to conquer this task with the built-in functionality of FileMaker 16, I began. I decided to start with the smallest table, teachers. Obviously there are fewer teachers than students, and fewer students than parents. Using Terminal.app I was able to get what I needed using this command. Obviously, I removed the actual authtokenvalue, because I’m not a dum dum. Open FileMaker, open my working database, create a field in the TeacherContacts table for the temp data dump. 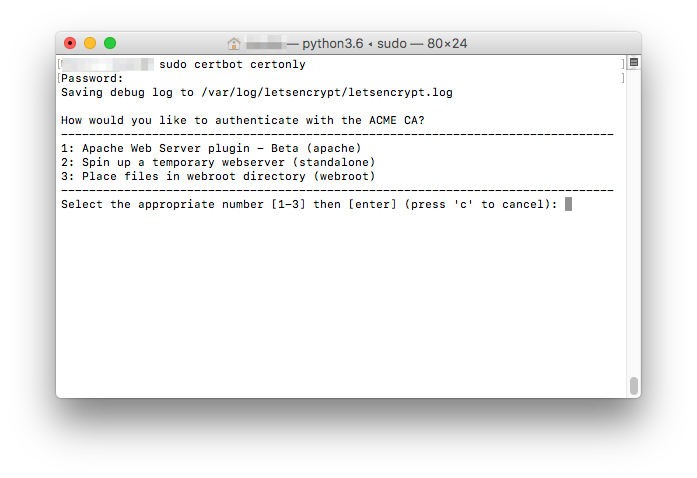 Everything matched my terminal command, the only problem was I was getting an error saying that “Authorization Failed.” Eventually I realized that my problem was using single quotes around auth-token. I replaced those with a double-quote and it worked perfectly. From there, I needed to create records, and to do that, I needed to know when to stop. The JSON array starts count at 0, so $jsonCount is one more than I need. I began a loop and immediately Set Variable [ $jsonCount ; Value: $jsonCount -1 ]. This would trigger every time the loop began. I then created a New Record/Request and Set Field [StaffContacts:id ; JSONGetElement ( $jsonTeachersFormatted ; "[" & $jsonCount & "]id" ) . I duplicated that for every field I wanted to import and modified id to the new field name. After all that I had an Exit Loop If [ $jsonCount = 0 ] and closed the loop. Now I had a script that would pull all the teachers from ManageBac, create a new record for each and bring in the data to FileMaker. Now I just need to get it to update a record if it already exists, rather than creating a new record. We’re getting there. I spent a long time trying to figure this out and it’s a lot easier than I thought. In the loop, after the decrease of the $jsonCount, I went to find mode, Enter Find Mode [ Pause: Off ] and Set Field [ StaffContacts::id ; JSONGetElement ( $jsonTeachersFormatted ; "[" & $jsonCount & "]id" ) . Needed to Set Error Capture [ On ] and ran the find Perform Find [ ] . And I’m done. I win! I just have to do this with all the other tables of data, relate them all and build the actual parent contact part. Adam installed a certificate using Let’s Encrypt for a macOS server running 10.12.6 and Server.app. It wasn’t exciting, but it worked. Now, three months later, we need to renew. It was actually really easy. Using the cp command enter these to copy your files. Replace <<FQDN>> with your FQDN. Replace <<USER>> with your username. Hooray, now these files are on your desktop. Are you doing your web hosting with Server.app? You’re probably not the biggest fan of it, but it works, so… let’s keep on keeping on. Do you want to have a free SSL certificate from Let’s Encrypt? Well, I found some really bad guides, so this is much better. We’re almost there. Now to get a certificate from Let’s Encrypt. It will prompt you to know what type of server you have. Choose 3: Place files in webroot directory. It will then create some files in a subdirectory called .well-known to confirm you have ownership of this website. Once that’s done it will save the .pem files for you. Apple has been seeding developer previews of macOS Sierra (10.12) since the Worldwide Developer Conference in June. I installed developer preview 6 and have been using that and version 7 since their release. Fortunately, everything seems to be running quite well. One of the features of 10.12 is Siri on your Mac. The one thing I use Siri for the most is the clock functions. Timers and alarms. 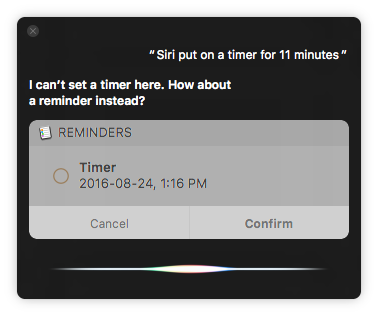 I tried setting a timer on my Mac using Siri, and there’s no functionality for that in 10.12. Perhaps Apple will add this functionality. In the mean time we are seeing SiriKit being made available to iOS developers in iOS 10, so perhaps we’ll see something similar in macOS 10.13. At my work, I have a motorized standing desk. I was looking for apps that would remind me to stand and sit at regular intervals. In the long run, I want an app that conditions me, so it starts at standing for an hour a day for a week, then two hours a day for a week, and so on and so forth. I can’t find that app. Instead I made a quick AppleScript that will prompt me to change position every 45 minutes. repeat while answer ≠ "Quit"
It’s been a long time since I’ve done any AppleScripting. I forgot how human it is. I expected not equal to to be !=, when it’s just the not equal to sign (≠). I expected else if to be elseif. I’ve thrown it up on my GitHub repo, you can find that here. A compiled version can be found here.